I have been skeptical of the Gustavo Dudamel phenomenon, because it seems like more a product of media hype than it does of musical inspiration. It was nice to see a younger-than-average crowd at the Musikverein for Dudamel and the Los Angeles Philharmonic’s Vienna tour concert on Friday (and I met an older woman who was at her first Musikverein concert, good to see her too), but I’m afraid that my first experience of Dudamel live was musically disappointing. Mahler’s monumental Symphony No. 9 is a challenge for any conductor, and I don’t think it’s one Dudamel has met yet. But to start, the orchestra sounded quite good. This was actually my first time hearing the LA Phil live, but it nevertheless felt like a homecoming for me, because they do sound American. The strings have more depth than many American orchestras, but I could ID the big brass and mellow woodwinds immediately. It’s difficult to trace a path through the symphony’s discursive first movement. Dudamel got off to a technically secure start, with clear textures and good coordination, but the character was strangely broad, warm, and serene, lacking dynamic differentiation and movement through the many twists and turns of tempo. Mahler’s essential world-weariness and bitterness was completely lacking, and the lack of emotional momentum made the movement less a journey than an amble between equally important sights. Occasionally the winds and strings would lose each other a bit, and the brass section would drown everyone else out, but the lack of detail and of dynamic contrast were larger problems for me. Dudamel seemed to take the bounciness of the second movement’s Ländler at face value, and it came across as cuter and less sarcastic than usual. This worked better than I expected, and by whipping the waltz up into something a little exciting, the piece finally began to go somewhere, though it still seemed oddly small-scale. The third movement was definitely the highlight of the performance, with vehement, vicious playing at a murderous tempo. Here, a certain lack of depth worked. The last movement was odd, taken at a very slow tempo (I think the running time was around 28 minutes), and displaying less resignation than bold passion. While this one-dimensional, deeply earnest, Beethovenian approach seems just wrong to me, it did work in a way, and the string sound continued to be good. But the various movements never quite added up to anything. I’m not saying that Bernstein morbidity is the only valid approach to this piece, in fact my favorite recording is austere Boulez, but without more character differentiation and gravitas, you just don’t have Mahler. Daniele Gatti will be conducting the Wiener Philharmoniker in this symphony at the Staatsoper on May 18, which is such a crazy idea it just might work. Los Angeles Philharmonic, conducted by Gustavo Dudamel. Musikverein, 2/4/2011. Mahler, Symphony No. 9. Did you say somewhere you weren't good at orchestral reviews?!?! Actually I kinda like Gatti's Mahler. Tonight's standing was sold out when I got there at 18:20, which was annoying as I was at the MV yesterday morning and could have easily got my ticket then. A kind old lady who couldn't attend very generously offered me her €96 ticket for €50, but I didn't have the cash on me, and also have a hefty January credit card payment due next week… It's a shame; I think Beethoven 7 would have played to Dudamel's strengths much more than the Mahler. I went to Pleyel in Paris last Monday to listen to the same program and was VERY disappointed. I didn't have time to blog about that concert, but since it was so disappointing I won't. On the other hand they did show some character in that performance, but it felt awkward: that character is not theirs. I guess Gustavo is trying to make them sound like if they were Bolivar. There were even a few boos in the end — which is unthinkable for the LAPhil, whose concerts in Paris are always a big success. Marcillac: I actually have never heard Gatti's Mahler, but in my experience Gatti automatically entails crazy. But I'm am reassured that it may be the right variety of crazy in this case; I'm going to try to go. SS: That's too bad! I think you'll survive, though. Tonight's concert was probably better than the Mahler, but the, um, life-changing capabilities of The Dudamel Experience are overrated, especially to someone of your ear. Also, the Bernstein symphony is a trial, IMO. P.S. I hope at least one of you guys is a Big Lebowski fan. It's only appropriate when writing about the LA Phil. I want my $@&!ing Mahler 9 rug back. Interesting thing about the Dudamel phenomenom is that it's a creation of social media. He was well exposed but didn't take off til bits of the 3rd prom performance went on youtube. Thousands who hadn't hear a full performance suddenly went wid and the whole thing snowballed out of proportion. Fairly typical response on discussion groups where no-one is quite what they seem but are exceedingly adamant. Grassroots evangelism, but many grassroots grassfires aren't good in the long run. As a commentator pointed out on my blog, Dudamel uses 6 horns, whereas Mahler indicates 4… it was the beginning of a NUMBER of problems with his approach. Thanks for your posts – it has been great to read other peoples' thoughts, particularly as critics' coverage of Dudamel's Mahler 9 in London was rather scarce (Pollini was playing Bach on the same evening). I had commented on one of your earlier posts, warning that expectations should be managed.. I was perhaps expecting too much from this concert. Interesting that (even with managed expectations) you too found it a disappointment. I wouldn't be too harsh on Dudamel. I think he is a major talent, judging from previous concerts and even a pretty good recording of Mahler 5. Attempting Mahler 9 in concert, in Europe, was perhaps a little silly. Like any other artist, he needs time to develop. And it doesn't help him that his development takes place under the spotlight of Hollywood and one of America's top orchestras. I am, in a strange way, glad to hear of the negative response from the Paris audience. I'm not a huge fan of boo-ers, but what I dislike more is undeserved enthusiastic applause (there was even standing ovations in London). With all the deceptive hype, I hope Dudamel still does get the message: more work is needed. Thanks so much for your excellent post, which I'm just now reading. It's always reassuring to know that I'm not the only one who hasn't drunk the Dudamel kool-aid. Seeing him season after season here in LA is hugely frustrating. Nothing ever comes off as a complete success. And now the LA Philharmonic is stuck with him for a decade with an entire Mahler cycle next season. There's so much work to do and I wish he'd do it somewhere else. Thanks for all the comments! Lots of interesting stuff. The horns thing goes with what I heard (I had a crappy spot way in the back of standing room and could barely see anything, much less count horn players), though I do wonder WHY you could ever think this is a good idea. When you have two people on each part at least they all balance with each other and the second people can drop out sometimes, but 6 on 4 is going to be trouble. EC, I think it would be condescending to cut him too much slack, actually. He's conducting a major orchestra in Mahler 9 at the Musikverein and if that isn't a statement of artistic seriousness I don't know what is. I bought a ticket for a Mahler concert, not for the Dudamel life story–though some people probably came for that. The reception in Vienna was much more euphoric than it sounds like it was in Paris, interestingly enough. A partial standing ovation, even. This surprised me, because I thought they would be pickier about Mahler here, but Dudamel has his Publikum, apparently (he's conducted here a number of times before). Don't get me wrong – I should clarify my earlier posts – no slack should be cut whatsoever. If you perform Mahler 9 in London, Paris, and (I would imagine most) at the Musikverein, you'll naturally be judged against the premier league of orchestras, with Abbado, with Haitink, with Jansons etc. (not to mention the now retired greats). What I would say, is that Dudamel shouldn't be outright dismissed, judging from some impressive previous performances he's given. What I would hope, is that the relevant lessons are learned… But what I fear, from the standing ovations in London, is that they wont be. About passion not substituting for skill, the great pianist Alfred Brendel made a poignant point in his recent documentary (though I wouldn't want to take his words out of context on this occasion, I thought it would interesting to share): something along the lines of, even with the most passion, without intellect, it will always be amateurish (NB not a direct quote). Watch his documentary – "Man and Mask" or similar title – highly recommended. On a more positive note, Rattle and Berlin perform Mahler's 3rd and 4th in London in the coming weeks.. I stumbled across this charming website which features thoughtful and caring classical music-lovers (and charming artwork in the banner). It's been interesting to read the many negative opinions about Dudamel on this tour and I think there's nothing wrong with people having different interpretative viewpoints about music. I particularly enjoyed reading the review here and on the whole didn't think it overly harsh. Still, I am struck by what seems to be a rush among music critics to find fault with Dudamel as if they felt a need to distance themselves from the sensation surrounding him. Again, not so much in the well-written review, but in the comments and in general across the Internet. Case in point – the reviewer's endorsement of reader Brian's ridiculously harsh blogpiece. "Passion substituting for skill?" I know you are all very sophisticated listeners – but are you expecting to be taken seriously when you casually dismiss the opinion of a Simon Rattle, a Daniel Barenboim or (I believe) Claudio Abbado when it comes to Dudamel? And you can be as snobby as you wish about the LA Philharmonic but you are aware, aren't you, of the reception that Dudamel received in Chicago during his first series of concerts with the Chicago Symphony – from audience, critics and orchestra members alike? And you're aware of their reaction a day or two later when the news broke that Dudamel had signed with LA? 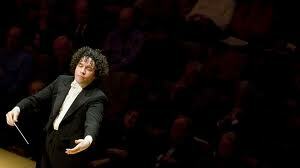 Personally, I have found Dudamel to be uneven but often brilliant, astonishingly so when he is. To use that word again – sensational. In so young a conductor, such highs far outweigh the lows, the promise outweighs the imperfections. I like the passion for music that websites like this show in their articles and in the reader comments. I can say that all of you deserve great music from dedicated artists and great conductors with talent honed by years of experience. You simply don't deserve a great young conductor at the moment of his discovery. I never said I thought Dudamel was too young to conduct Mahler 9. I said I didn't think he mastered it yet. I didn't say anything about this having to do with age. The thing about hype is that we "music lovers" don't like being told what to hear, from the Palinian lamestream media or from Claudio Abbado, beloved though the latter may be. We especially don't like it when we are told that what we are hearing is flat-out wrong and that this makes us bad people (and I should note that I'm not old enough to say I'm very experienced but I do have formal musical training). Because I found Dudamel lacking in some respects I don't deserve to hear great young conductors? Please. Read my reviews of Yannick Nézet-Séguin, Daniel Harding, or Andris Nelsons. I think Dudamel may do well with one of Mahler's earlier works. But the Ninth has a fin de siècle ambivalence that seemed to elude him. I'm pretty sure Dudamel has gotten far beyond his "point of discovery." He's been one of the hottest things in conducting for at least four or five years now, though his wider fame is more recent. He's the music director of a major orchestra and deserves to be criticized as such. As I said, I enjoyed your review and wasn't, for the most part, directing my comments at it. No one's telling anyone what to hear. No one's telling anyone to give up their preferences or what they've learned to embrace in music. If anything, it's the other way around – the anti-Dudamel crowd is telling the rest of us what to hear and are telling us that we aren't hearing what we think we're hearing. We're being told by the more vehement ones (not you) that he's too young, too unformed, superficial and one-dimensional, a product of hype and that the rest of us are just drinking the kool-aid. Really?? All the musicians of the LA Phil? The Chicago Symphony. The NY Phil. Rattle, Abbado, Barenboim. The audiences in London and Vienna who gave him a standing ovation. I know what it's like to be overly critical sometimes. I know the temptation of being somewhat of a snob and having a better, more refined, opinion than those of others. Hype is a double-edged sword. Anyone as wildly played up as Dudamel is GOING to get a backlash, it's inevitable. And that is at least in part his own damn PR's fault. I'm not part of it, I saw one performance, it wasn't very good, it suggested to me that his hype may have landed him in a place that won't allowing him the space he needs to grow as an artist. But that's not a conviction or accusation, it's a suspicion or a concern, because I would like to protect someone with a lot of raw talent. I don't want to devalue the experiences of new concertgoers who are inspired by Dudamel. Obviously this is something that should be encouraged. But popular validation is a completely different affair than artistic achievement. Classical music wants to be a meritocracy, but it is very far from that. And I consider myself a critic, not an applause meter. I can't say if I agree with the rest of Brian's writings on Dudamel, obviously I haven't heard Dudamel nearly as much as Brian has. But I thought the post I linked to above was astute and not exactly radical. It's not just hype – that's the first point. Nor is it simply popular validation. Regardless of the publicity suddenly surrounding him, Dudamel has made a genuine impression on exceptionally talented musicians, sophisticated audiences and casual listeners alike. You may raise legitimate questions of interpretation and style but a constructive discussion about Dudamel can't simply thrust sophisticated listeners (the critics) on one side and Philistines and hype-meisters on the other. But to return to my wicked (and it was deliberately and self-consciously wicked…) comment about not deserving a great young conductor at the moment of his discovery – Yannick Nézet-Séguin, Daniel Harding, and Andris Nelsons don't count. It's not the same and it's not because they aren't tremendously talented — I'm content to take your word for it that they all are — it's just that either they aren't "great" (at least like, say, Carlo Maria Giulini was great) or, even should they turn out to be great, they haven't had their "moment of discovery" where the spotlight is thrust on them at an early age. Because someone can always find fault and will — especially in someone new and young. And especially if they are new and young and famous. Yet even if the faults are more or less real in the young artist, who cares about perfection? Why should we expect Gustavo's Mahler 9 to be fully realized today as if, at 30, he was giving his final artistic statement on it? Just as we wouldn't expect Abbado's 9th when he was 30 to be the same as his 9th today. Why would we even want it to be? Isn't one of the fascinating things to see an artist's interpretation change over the years and to mark their change over the decades? But we value the early performances of an Abbado anyway, we accept it as part of an artist's natural growth, and without the earlier work you don't get the later one. We should recognize these early trials and tribulations for what they are and also that the carping is to be expected and often the product of unreasonable expectations (or worse). That's the basis for my mischievous assertion that most critics of Dudamel today, while a very deserving audience of great music in general, are (merely) guilty of not deserving a great artist who discovers sudden fame at an early age. None of which assumes* that Dudamel actually is, or will be, a great conductor. (*It really was a wicked comment full of hidden traps) But any young conductor, even the truly great one, who becomes this much of a sensation will draw a lot of flak from a lot of people looking to find fault. Thoughtful criticism, like the original review, is welcome, even vital, but we should stay enthusiastic and be of good cheer — as Socrates exhorted his followers before he drank the hemlock. I think the fish that you are frying is much larger and more vaguely defined than mine. I've got a concert. You've got the world at large. I don't think we're going to get anywhere here. My feeling on Dudi is just that he is an extraordinary talent but of a very particular kind. Like Gergiev, he has an "outsider's perspective" that will continue to do things to familiar works that strike most of us as downright weird. He seems to be cherrypicking the things in each piece that interest him to the detriment of the elements that don't. I don't think he'll ever reliably give 'front to back' renditions that satisfy in the way that say…Vladimir Jurowski and Daniel Harding are capable. But I'm sure that as he gets older he'll be able to give great, very personal readings of pieces that are meaningful because they're different. Also….if you want to hear a young conductor give a great Mahler 9, check out the BBC broadcast of Andris Nelsons doing it in Birmingham. I am also naturally inclined to be skeptical about mass/social media-hyped star conductors. But I heard Dudamel with the Gothenburg SO in Brussels and they pulled off a very good Nielsen 4th. Not sensational, but very good. And given how many conductors go completely astray in this elusive work, this deserves respect. So, as far as I am concerned, the jury is still out on Dudamel. Thanks to Evan Tucker for the link to Andris Nelsons' Mahler 9 in Birmingham. Very impressive! I had some problems with the Internet connection but from what I heard it sounded fantastic. It was thrilling, the way we hope to be thrilled by a young conductor, and at the same time coherent, cohesive, and constantly engaging, unlike Dudamel who often takes a path which loses a lot of us on the way. I may yet regret having Dudamel in LA and join the skeptics. But for now I prefer to think that maybe, in Nelsons and others, there may just be some phenomenal young conductors out there right now and with any luck, in the wake of Dudamel's stardom, they may be discovered by a wider audience. I guess I shouldn't complain about a conductor younger than 40 (30 at the very youngest) isn't about being about being able to perform the work competently, it's just so young conductors don't yet have the emotional maturity or life experience to really master the work. I hear MTT conduct the 9th when he was still in his 20s in San Francisco and he barely got through it without falling apart. That was many years ago, however, when Mahler was not yet a standard repertory piece, so the orchestra itself was relatively unfamiliar, itself being youthful. Very enthusiastic as I am about Dudamel's promise, some unsettling, at times disturbing as his Brahms 4th DG Concert on iTunes, which is just plain wrong wrong wrong on crucial metric ideas to performing any Brahms work, let alone one of his greatest works in the genre—I find myself embarrassed to think it won a Grammy, though they're people's choice awards so unavoidable with Dudamel's. popularity. It was as slack a performance as I've ever heard and I wonder where Gustavo's head was at at the time.